Everyone had heard or said this at least once in their lifetimes. This subjective statement contains heavy use of relative words, but it doesn’t stop people from engaging in an intense and exhaustive debate, because music is such a personal thing. In fact, music has been personal ever since the oldest surviving noted work of music was discovered, which is said to date back to approx. 1400 BC. For a long time, the only way people could experience music was to listen to it live from a performance usually in the company of other people. The access to music was rather limited and disposable. However, in the year 2014, we listen to music whenever, wherever, whichever and however we want. Music has never been so personalized since the discovery of music, thanks to the introduction of portable audio devices. In the late 1880s, the LP player was developed and it gave people a chance to listen to their choice of ‘recorded’ music. As revolutionary as it was, the accessibility was rather limited in terms of place and time considering its size and functionality. While the record player picked up steam in the first half of the 20th century, it never became portable. Then in the 1980s, cassette players were developed. This introduced the concept of a portable audio device, which allowed people to listen to music wherever and whenever they wanted. Music became more customized to people’s lifestyle, therefore, personalized. This also facilitated a new approach to music, ‘collectables’. For example, Samsung’s mymy (1982), a 400g lightweight cassette player, allowed users to make a ‘mixtape’ with the songs they recorded from the radio. People were allowed to collect their favorite music and listen to them anywhere and anytime. It marked a new phase for music as an experience and it allowed people to appreciate music even more. This level of personalization and the concept of collecting music continued to the 1990s, when portable CD(Compact Discs) players appeared. Now a higher quality audio recording was available to the mass audience. However, when music became ‘Digital,’ the stage was set for a new era of music experience. 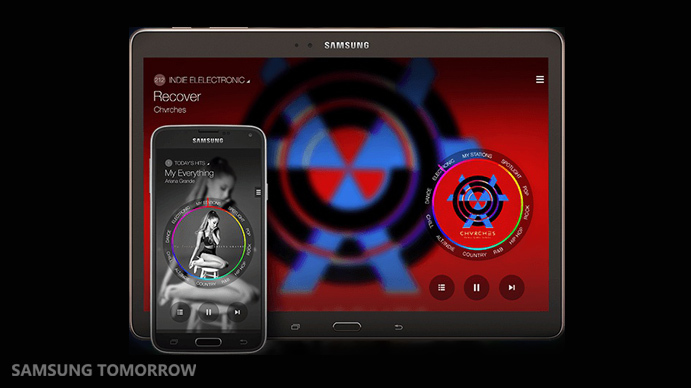 Phase 2: Music becomes digital and freer. The biggest change that the digital format brought to music was in terms of accessibility and quality. First of all, as mp3 players became popular, they enabled users to easily access an enormous amount of music due to the small file sizes. However, because of its improved accessibility and availability, the concept of ‘collecting music’ as a physical collection gradually phased out. This allowed people to concentrate and improve their listening experience. Not only did the accessibility improve, but the quality of music experience also significantly improved compared to cassette tapes as it was less prone to damage. MP3 players also allowed people to select the order of songs played; now, rather than an ‘album’ unit, they could enjoy the music ‘song by song’. For example, launched in 1998, Samsung’s YEPP was the smallest mp3 player with the dimensions of 58 x 85 x 17 mm. The first model could save ten 4-minute songs (40 MB) and its LCD screen showed the song title, artist name, and playing time. In the mid-2000s, YEPP was developed with enhanced capacity, battery life, and design. It gave listeners more freedom in terms of how they want to listen to music. Starting in 2006, as smartphones became more prominent, and featured a music player function, MP3 players started to phase out. However, music continued to become more of a constant in daily lives than ever before as users not only have consistent and constant access to it whenever wherever, but also however. We are experiencing the most advanced music listening experience. First of all, there is virtually no limit in terms of accessibility of music, regardless of time, place and its type or style. Smartphones not only saves thousands of music, it also let users to stream high quality music streaming services that offers countless of music with high level of customization and personalization. Talking about customization and personalization, the smartphones’ capability to execute apps allowed people to customize to their preferences. Not only did it allow people to enjoy the highest quality of sound, it also let people adjust the sound to their preference through high quality equalizer. 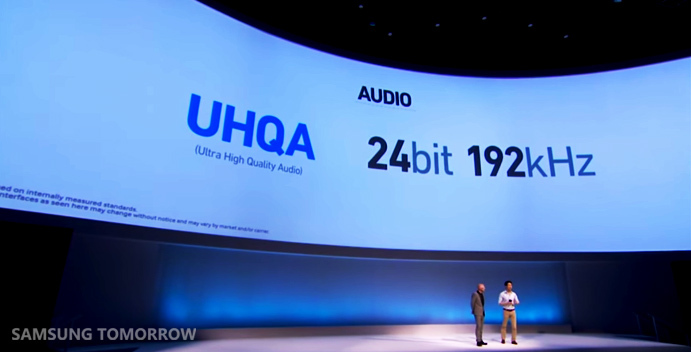 The newest Galaxy Note 4 (including the predecessor) features UHQA (Ultra High Quality Audio), which the music player supports 24 bit, 192kHz audio. 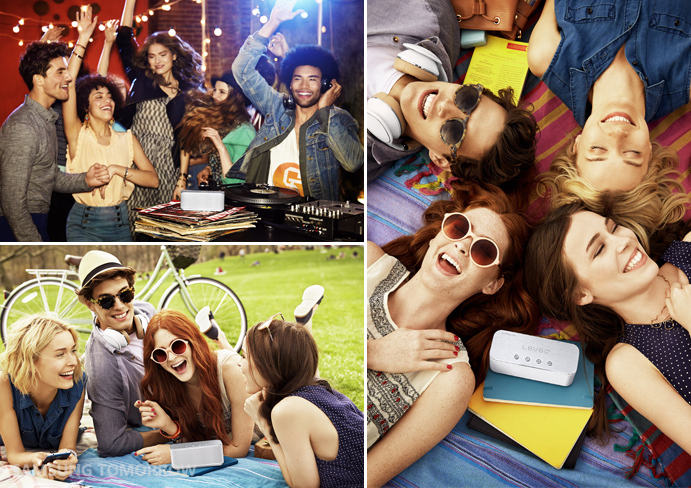 Also, Samsung smartphones offer high quality music services such as SoundAlive and Music Square. 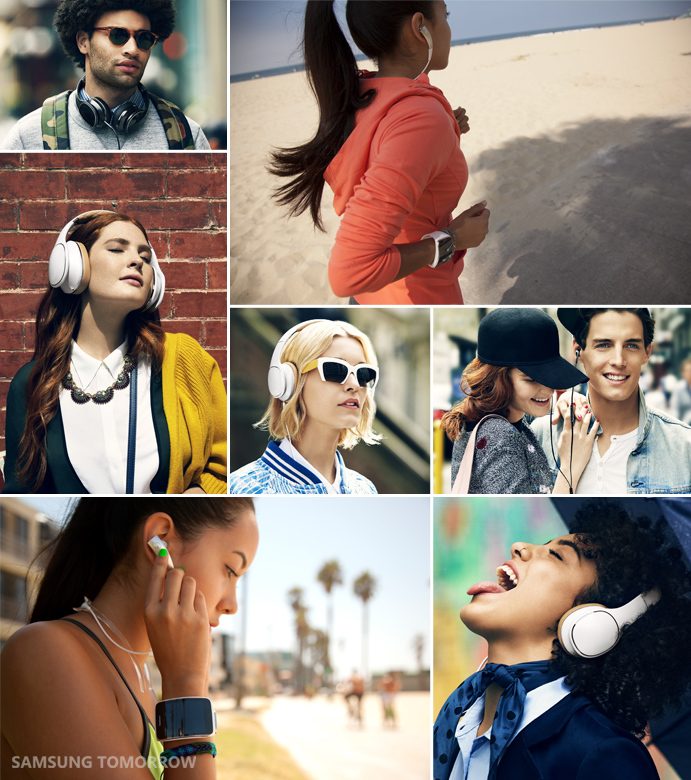 SoundAlive feature of the Galaxy smartphones offers many sound options that user can choose from to fit their tastes on sound color. It provides 25 EQ presets for tailoring sound color and users can select various sound effects including Tube Amp effect, Virtual 7.1 (Surround effect), and Concert Hall effect. Music Square is a music service that provides a series of songs having similar mood as a playlist. From the waveform of each song, it extracts mood information and creates a playlist consist of songs that have similar mood – ‘Exciting’, ‘Calm’, ‘Passionate’, and ‘Joyful’. Furthermore, if you’re a music lover, whatever the genre you prefer is, you might already use or have thought of buying headphones or quality speakers. Now that people can appreciate premium sound, audio accessories such as headphones have become not only a way to listen to music, but an extension of style and personal expression. 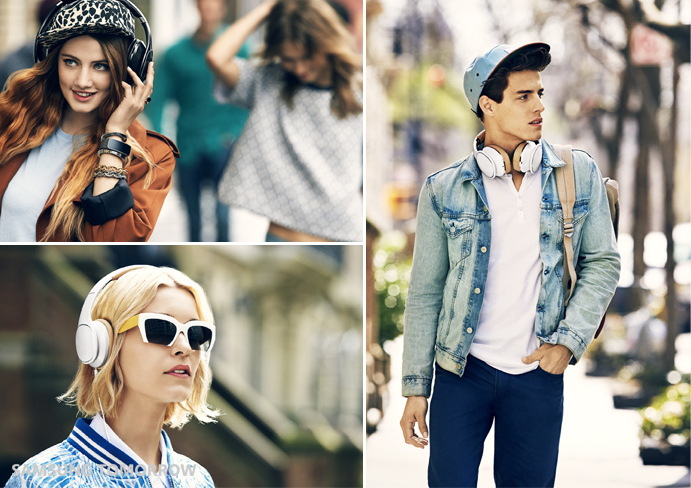 ▲Audio accessories have become an extension of style and personal expression. 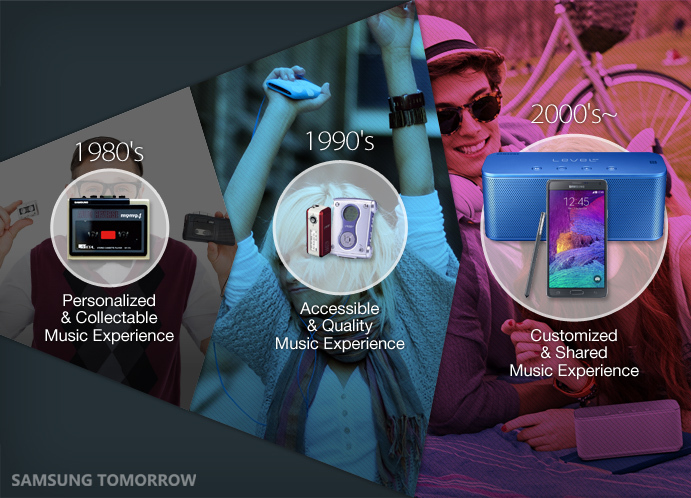 Most importantly, smartphones also allowed our music experience to evolve to a whole different level. With the high level of accessibility, quality, customization through various apps and accessories, listening to music is no longer limited to a personal experience. People have naturally begun to ‘share’ music more often. ▲Not limited to a personal experience, people share music more often. From LPs and cassette to the smartphones and headphones, audio devices have been developed and changed the way we listen to music. Collecting music to sharing music, and having more freedom of customization and accessibility, all in higher quality, are changes that happened so quickly over the past couple decades. Many of us have been a living witness of this change, but it is often that we take this evolution of experience as granted. We thought it would be interesting to remind you and help bring back old memories of how you used to listen to music. So what do you hope the future brings? Feel free to leave your thoughts in the comments below.